I recently purchased a Rami and LOVE it, but not so much the rubber grips. Does anyone know of any active makers of custom wood grips? I've emailed Hakan, Esmeralda and Marschal to no avail. Heck, at this point I'd buy some second hand if I could find them. This gun deserves a suit, not cargo pants. I have a couple of sets custom made for me by Hakan and I could probably part with one. If you want a set send me PM. 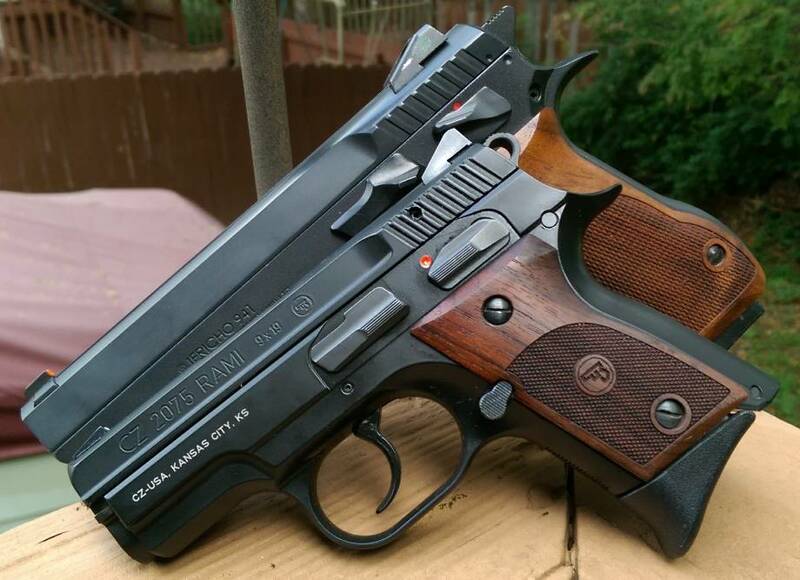 Dennis Marschalko is hard to reach in Hungary Esmeralda does not make RAMI grips and CZ custom lists some on their web site but I have never seen them on a pistol. Altamount announced that they are going to be making wood CZ grips soon. I have no experience with Altamount grips. I prefer wood grips also. Finding good ones for CZ's is difficult. Yes, I will definitely take you up on that offer. Thank you, PM sent. You could try GRIPS4U:- http://grips4u.net/category/pistol-grips/ . They have a couple of styles for both the RAMI and the RAMI BD on their website. Yea, I've looked at them. Didn't really care for their scales. I would order from them, but they don't offer them smooth. To each their own but why would you want them smooth? Those look sweet how is the actual feel? Do they have enough texture? So I can send them to be engraved. 1) I initially bought wood grips because I flat-out love the look. Nothing more than that. 2) I have larger hands and the slightly extra grip thickness helps to fit the RAMI to me a bit better. 3) For EDC, clothing doesn't get caught as easily on the wood panels as it does on the rubber pieces. 4) I do have to sacrifice a fair amount of grip stickiness when it comes to shooting. This is pretty-much a non-issue for causual range outings but can be noticable when competing. W. the caveats in the thoightsI just posted, they feel great. Texture could be a little more coarse but isn't too bad. This is my carry gun. I'm dressing it up and making it more comfortable for daily carry. I don't do any competition.